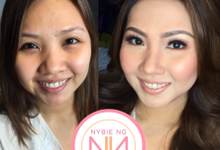 From the first start we knew that Ms. Nybie Ng and her team give an excellent service. 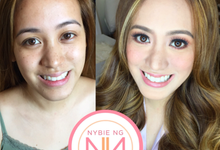 We saw her page and we was mesmerized on how the client's look after Ms. Nybie finished her obra/job. She testify the beauty of her client. 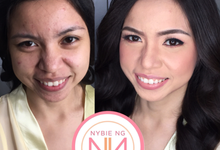 You did a great Job Ms. Nybie. Thank you so much for making our big day indelible. definitely one of d best decisions i've made for my wedding!! 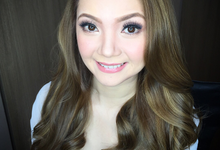 thank u ms nybie and paola for making me look like a fairy tale barbie princess! my hubby and my guests loved it! even d kids agree! thank u also for being easy to work with, even helping me with my gown and making sure i look perfect as a bride! 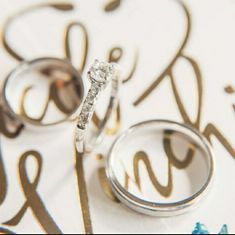 will definitely recommend to all bride-to-be. 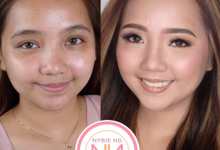 Nybie and her team will absolutely take care of you! 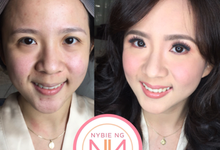 Choosing Nybie Ng and her team was one of the best decisions I had to make for our wedding. 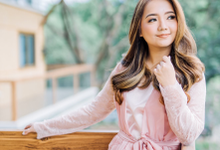 We had her wedding package for prenup and on the wedding day itself. We had DIY set up (no stylist), different wardrobe malfunctions and a lot of sweat during our photoshoots but she helped out on all of it! She made it sure that our looks (and wardrobe) would be fabulous on camera and even if she was not a stylist her art showed through. My transformation was just fresh without extremely altering my facial features. 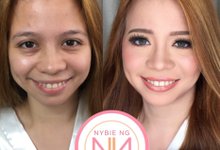 In seeing her doing airbrush technique, choosing the right colors to match your skin tone and blending them in was effortless and the result was outstanding. She and her team helped me on my nerves during the preparation process. All of them were fun to be with parang matagal mo na silang kakilala and they were really really nice and on time. :) Lastly, Nybie helped me with my hairdress that I failed to make and it turned out to be beautiful. That is what passion is all about! My mom and husband were really happily pleased with the services that she and her team did. 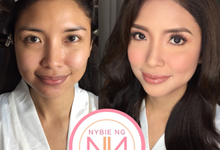 So book Nybie and her excellent team now! I just really love her and her team! 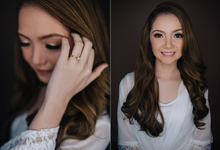 We do 3 make up looks for our bride on her wedding day. First, is on her pre gown look and hair down. 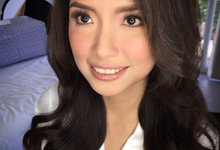 Second is her ceremony look usually brides opt for a more classic look. 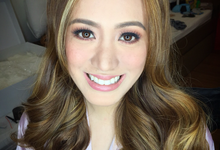 Third look is before the reception proper, usually we put the hair down for a more relaxed look and change the make up depending on the bride's preference. 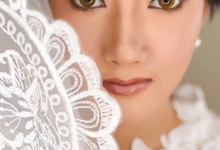 The most ideal time is immediately after the date has been finalized since we only do one wedding per day to best attend to our bride. 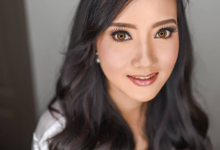 We make sure that our bride is comfortable and confident with the look that she wants to achieve on her big day because not all brides are comfortable with wearing make up. 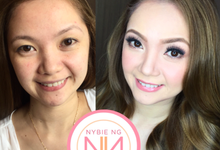 We make sure to collaborate with the bride to achieve her dream wedding look. 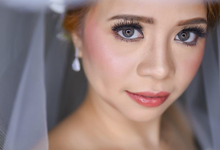 Our forte is to enhance our bride's best feature to make her look fresh and radiantly beautiful on her big day. 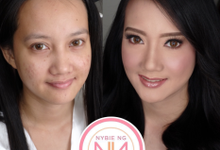 We have professionally been doing make up since 2010. 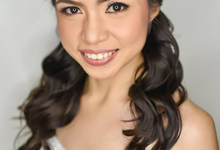 Its our 6th year in the wedding industry and we have been doing our passion in full-time since 2012. 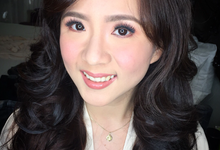 We have been in the wedding industry for the past 6 years specializing in Bridal Airbrushed make up. 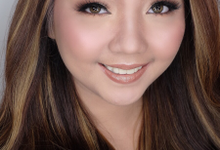 Our passion is to empower women and bring out their confidence through the use of our experienced hair and make up artistry skills. 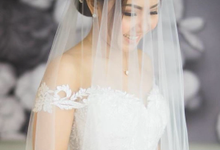 We aim to bring out our bride's natural beauty and enhance her best feature that will truly make her the most beautiful on her wedding day.